You make better farm decisions when you have better information, that's why Herdwatch lets farmers see their Eurostars, EBI and Milk records on their phone. Herdwatch has been helping farmers record and manage their farm information since 2014, constantly adding features and innovating for Suckler, Dairy, Beef, Sheep and Tillage farmers. This latest feature in Herdwatch gives farmers access to their ICBF information through the app when they need it. Herdwatch has a live link with ICBF which means any information on your ICBF account such as, milk records, EBI information, Euro-Stars, past breeding records, AI technician serves and freeze brands will flow seamlessly into your Herdwatch app. This eliminates any duplicate recording for the farmer and ultimately makes recording such information more accurate and less time consuming. 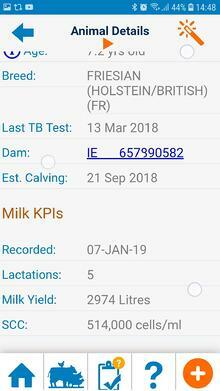 Herdwatch has a live link with ICBF that allows Dairy farmers to see their milk records on their phone. Arming farmers with this information means that they can decide what cows might need to be culled because their milk yield is too low or their Somatic Cell Count (SCC) is too high. How many Stars has that animal? Suckler farmers can see what stars each animal is by simply looking at their phone. The app lets you see what cows or heifers are 5 Stars, what their replacement value is and when that information was last updated. Herdwatch will download all your mart prices and weights when the mart uploads them to Herdwatch. This means that you can get accurate reports on what animals are leaving you the most money and what cows produce the best calves. Herdwatch is fully compliant with Bord Bia and conforms with quality assurance standards. It is fully integrated with ICBF to download breeding, milk recording and EBI/Eurostar information.